The United States Navy maintains a superior global Anti-Submarine Warfare (ASW) capability with the ability to detect, localize, identify, and track potential hostile submarines. This is provided by the capabilities of sonobuoys. A sonobuoy is an electronic sensor dropped into the to provide the data required to detect, localize and destroy submerged submarines. Sonobuoys are used to determine environmental conditions for determination of best search tactics, to communicate with friendly submarines, and to conduct search, localization, tracking, and, as required, attack of designated hostile platforms. Passive Sonobuoys quietly listen for acoustic (sound) energy from a target. Active Sonobuoys emit a sound pulse (ping) to generate an echo from the target. Special Purpose buoys provide information about the environment such as water temperature, ambient noise level, etc. Sonobuoys provide both a deployable acoustical signal source and reception of underwater signals of interest. These received signals are transmitted to any monitoring unit(s) that then process the signal for analysis, classification of any target, and recording on magnetic tape media for replay and post event analysis. Both the initial detection of submarines and the localization of detected targets is usually done with passive sonobuoys, if possible, so as to deny for as long as possible the submarine becoming aware that an adversary aircraft is present. By use of established tactics, the sonobuoys allow for short and long range detection of surface ships and submarines, thereby, allowing for prosecution of identified hostile targets. Other specialized sonobuoys can detect electric fields, magnetic anomalies or the light emitted by microscopic organisms disturbed by the passage of a submarine [bioluminescence]. Active sonobuoys are used to localize targets quickly and accurately in extreme environmental conditions, against a very quiet submarine, or in an attack mode. The released acoustic energy enables an accurate location from the sonobuoy in both range and bearing to the submarine. When two or more "fixes" are obtained the speed and the course of the target can be established. Active buoys use a transducer to introduce acoustic energy into the water and to manipulate the return echoes which are amplified and for VHF radio transmission. These buoys are designed for deeper depths than passive buoys. Sonobuoys may be classified by size ( A, B, C,etc.) and type (active, passive or measurement). 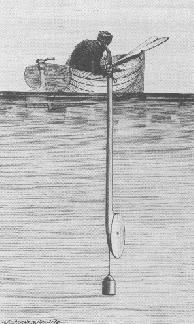 Most American sonobuoys are A-size length 36 inches, diameter 4 7/8 inches. The A-size sonobuoy weight varies by manufacturer and buoy type, but will not exceed 39 pounds. Some other countries are using half size or A/2 as a standard configuration. All sonobuoys currently in inventory are normally launched from standard A-size tubes via pneumatics, free fall, or a Cartridge Actuated Device (CAD). When launched from aircraft they employ a parachute to retard their descent and provide descent stability. Shipboard personnel may also launch them by hand or Over the Side (OTS). All are powered by either salt water activated magnesium or silver chloride, lithium chemistry, or thermal batteries and are designed to scuttle at some point after usable or selected life expires. The BT, DIFAR, LOFAR, DICASS, VLAD, and DLC sonobuoys are used in conjunction with the on-board systems of the P-3C, SH-2G, and SH-60B/F aircraft. The P-3C Update III, SH-60B Upgrade, SH-2G Upgrade and SH-60F Upgrade are potential recipients of the ADAR sonobuoy. The AN/SSQ-110 EER sonobuoy will operate with the P-3C Update III to form the EER System. The AN/SSQ-110A EER sonobuoy will operate with the P-3C Update III to form the EER and Improved EER Systems, respectively. The SH-60B Upgrade, SH-2G Upgrade, and the SH-60F Upgrade are potential recipients of the EER sonobuoy. The statement of managers accompanying the conference report on the Department of Defense Appropriations Act for Fiscal Year 1994 (H. Rept. 103-339) directed the Navy to submit a report on sonobuoy inventories, projected over a five-year period, that accounted for shelf life, procurement and usage rates, and future requirements. The Assistant Secretary of the Navy for Research, Development, and Acquisition sent the report to Congress on April 13, 1994. The report, which was based on a very thorough inventory, indicated that the quantities of sonobuoys authorized and appropriated in fiscal year 1994, and those requested in the 1995 budget request, did not properly reflect actual Service requirements. The Navy subsequently initiated a reprogramming request to shift fiscal year 1994 funds to procure the proper mix of sonobuoys.